Dinosaurs. On. A. Spaceship. For some, a proposal that might induce glee. I come from a more cynical viewpoint. Remember the 'Snakes On A Plane' film? For your sake, I hope not. Nonetheless, 'Dinosaurs On A Spaceship' carried on the solid opening episode, 'The Asylum Of The Daleks' - without ever threatening greatness. Ten months on from 'The Asylum Of The Daleks', the Doctor brings together a little gang to take on his latest escapade - averting the destruction of an unmanned spaceship hurtling toward Earth, with its baffling prehistoric contents. They have six hours to find out why there are dinosaurs on the ship and save not only the creatures but themselves. 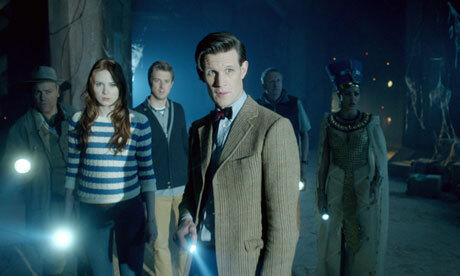 The gang is a curious one, combining a big game hunter (Rupert Graves), Amy (Karen Gillan) and Rory (Arthur Darvill), Rory's dad (Mark Williams), and Queen Nefertiti (Riann Steele). Of course. Battling against a grumpy old villain (David Bradley) and his two robotic sidekicks, enjoyably voiced in an especially camp fashion by David Mitchell and Robert Webb. In a similar manner to the way last's week episode's best moments came in the more emotional beats rather than the overriding storyline, the everyman perspective of Rory's dad proved to be this episode's highlight. "What sort of a man doesn't carry a trowel?" he hilariously proclaims at one point - a mixture of Rory's endearing worry and the gleeful whimsy that has come to typify this Doctor's era. 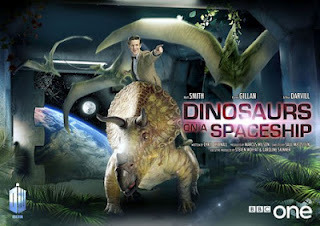 Chris Chibnall's fairly entertaining script draws inspiration from the likes of Douglas Adams and 'Jurassic Park' before taking an unexpectedly dark turn at its conclusion, further shining a querying light on the Doctor's so-called pacifism. More and more, it is his companions that seem to keep the Doctor in line - the foreshadowed loss of Amy and Rory becoming ever more poignant. They will truly be missed. 'Dinosaurs On A Spaceship' is on BBC iPlayer until 19:19, Sat 6 Oct '12.